Note:In order to take pictures effect, we use a relatively hard material fabric.You need put a wrap or blanket on the pillow, can not directly put the baby on the pillow. For the reason of transport,maybe the pillows seems to be a little plicated and flat. DON'T WORRY,IT IS NOT BROKEN,Just need few mins get back into shape. Take them out and emphatically pat them everywhere like the picture.A few mins later , they will get plump appearances. ❤PROFESSIONALISM: M&G House has been committed to the development of baby photography props for many years. The development and release of each product is a great advancement. Our top design will occupy a different position in the same product. ❤ENDEAVOR: About 50 skin tests, we have chosen the most suitable fabric and the most appropriate amount of cotton to ensure the stability and comfort of babies when shooting, WYSIWYG, the sample of the photo shows the product you purchased . If you are not satisfied with us, please let us know and we will solve all problems. ❤EARNESTNESS: DO NOT CHOOSE samples of virtual photos, their real products will be out of imagination. There may be problems such as rough fabrics, missing lines, and dryness. M&G sincerely recommends that you believe in physical pictures and refuse to be deceived. Every baby is an angel， we are afraid of that they are hurt by bad products, this is our constant pursuit to improve our products. 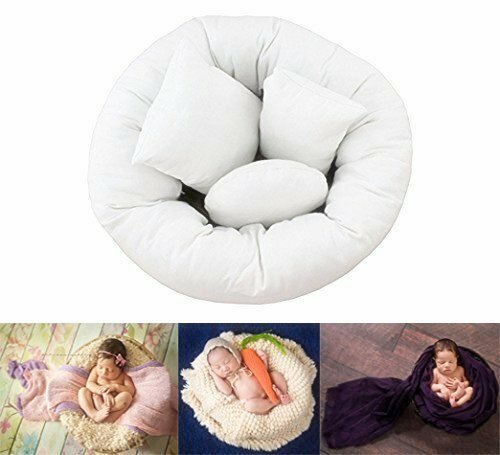 ❤RESPONSIBILITIES: These styling pillows will help you in a variety of postures, you could place them in any basket or other photographic container and use your favorite fabric or blanket outside to get a special set of three-dimensional memories. We will provide you with free shooting tips and advice all the time. ❤SUBLIMATION: Our research took into account the zipper problem, repeated trials, and finally decided to use multiple hem to hide the small zipper, will not scratch the baby when shooting, because according to the baby's body shape, the demand for cotton is not the same, the excess cotton is requested for free to achieve a three-dimensional shot. If you have any questions about this product by M&G House, contact us by completing and submitting the form below. If you are looking for a specif part number, please include it with your message.